Chiprovtsi Monastery was built by the Bulgarian Catholics in the tenth century. Throughout the period of its existence, the monastery survived six fires and destructions, after which it was revived again. According to the chronicles of the monastery the first destruction happened in 1404 after the revolt of Constantine and Fruzhin. The suppression of the Chiprovtsi uprising of 1688 had really crucial consequences for the holy monastery; the rich monastery library containing valuable Slavonic books and icons was also destroyed. Because of the damages from the uprising the Bulgarian Catholic population was forced to emigrate from the area. Thus the monastery was abandoned until the XVIII century, when Orthodox monks settled therein. They reconstructed the monastery as required by the Orthodox rites; they established good connections with Russian monasteries and even sent representatives in Russia. In 1800 the Russian Emperor Paul I donated to the monastery a Throne Gospel with silver plating, which today is part of exhibition of the NationalHistoryMuseum. The revival of the monastery lasted briefly, since in 1806 it was plundered and burnt by Yusuf Bey Pasha of Berkovitsa. This started a series of fires and efforts to recover the damages. In 1818 the monastery was rebuilt to be burnt once again ten years later. Yet another revival of the monastery took place in 1829. This was also the time when the church St. John of Rila was built, which is still serving the monastery nowadays. In 1837 fire once again absorbed everything. After the monastery was rebuilt again the last burning of the monastery followed after the liberation from the Ottoman Rule. During the uprisings in north-western Bulgaria, the Chiprovtsi Monastery was housing several thousand rebels. The monks themselves also joined the rebels in the Lom Uprising of 1867-68. 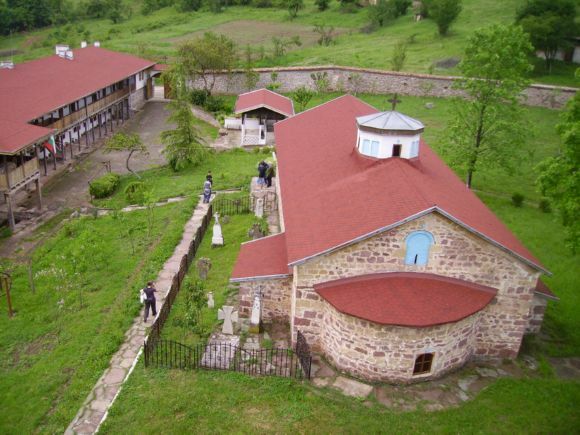 In July 1876 the group of rebels lead by Panayot Hitov and Philip Totyu fought battles close to the monastery. Currently the Chiprovtsi monastery is still functioning. The complex consists of a church, two chapels, three-storey bell-tower, residential and farm buildings. Because of the terrain features and the steep gradient outside the monastery looks like a massive fortress and inside the visitors get the impression that they were dug in the ground. The church St. John of Rila is located in the middle of the monastery yard. Upon the conversion by the Orthodox monks in the late 17th century the original frescoes were covered with lime, but one can still see through beneath the white layer the geometrical and floral ornaments of the Catholic period. The iconostasis is carved and decorated with painting and gilding, and the icons on it are the work of Christo Enchev, an icon painter from Koprivshtitsa. The three-story tower with an ossuary keeps the bones of the dead monks and the rebels perished in the Chiprovtsi uprising. On the second floor there is a small chapel – “St. Athanasius” whose interior is entirely decorated with frescoes. On the top floor, where the bell is located a beautiful view of the courtyard and the surrounding hills reveals. The St. John of Rila Monastery is located 6 km from Chiprovtsi and 30 km west of Montana. Situated at the foot of YazovaMountain, part of the Western Balkan Mountain. The most convenient way to visit the monastery is to travel by car because the nearest railway station is in Montana. If you are driving by car from Sofia you can choose between two routes – the E79 to Montana or through the Petrohan passage – a road that will take you through Berkovitsa directly to Chiprovtsi. Please note that Chiprovtsi Monastery does not offer accommodation and food. However, you can plan your night stay in one of the neighbouring towns – Chiprovtsi, which is renowned for its beautiful hand woven carpets and goldsmiths or in Belogradchik, where you can visit the famous rocks and the Kaleto Stronghold.